Anchor are specialists in dementia care and recognise a person with dementia is, first and foremost, a person – unique and with a rich history of experiences, abilities, skills, knowledge, preferences, desires and personality. The term “dementia” is used to describe the symptoms that occur when the brain is affected by specific diseases and conditions. Symptoms include loss of memory, confusion, problems with speech and understanding and differ from person to person. Find out more about dementia. 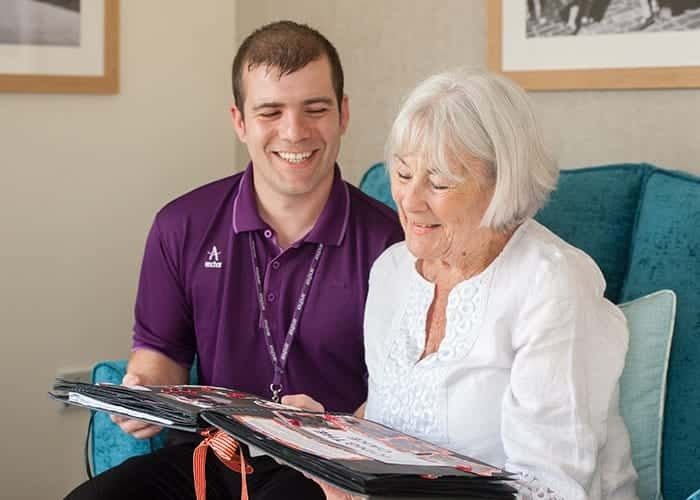 All of Anchor’s residential care homes have a dedicated dementia specialist and carers specially trained to provide tailored dementia care that enhances quality of life. 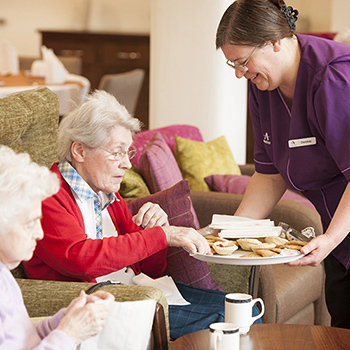 We care for residents living with dementia as individuals. By responding to the individual and supporting what they can do with a personalised care plan, we look for opportunities to build on their strengths and abilities to find ways to compensate for losses brought about by dementia. Our approach to dementia care respects the uniqueness of each person rather than focusing on the diagnosis of dementia. 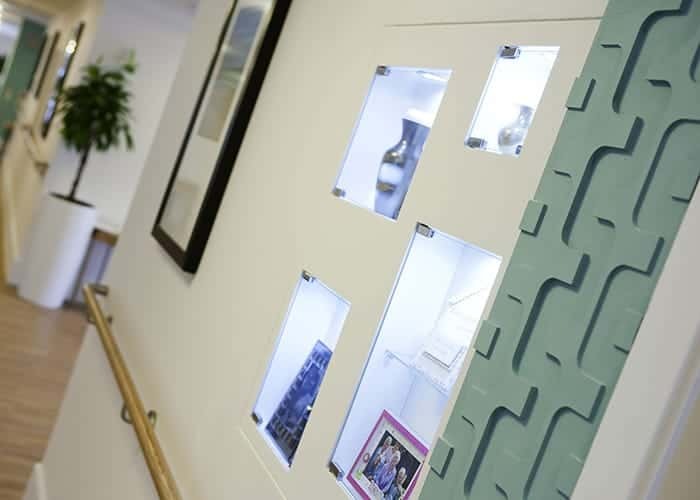 Anchor continually consult a range of leading dementia specialists to ensure that our care homes offer dementia care in safe, supportive, specially adapted environments that maximise a person’s independence and enhance their self-esteem. We are committed to providing on-going training in all areas of dementia care to all members of the care home team at an advanced level. This ensures everyone is knowledgeable and confident in their approach and care delivery. Anchor Inspires is our innovative model of truly person-centred care for people living with dementia. It is an internal accreditation awarded to care homes that deliver the highest quality and standards of dementia services. We use the resident’s life story to build a picture of their preferences, lifestyle, history, family, likes and dislikes. Our carers are trained in completing detailed care plans with the help of residents, their family and friends. These plans are used daily and help to maintain the identity and dignity of the person as the dementia progresses, providing important information, such as how they like their cup of tea. Life story supports the person in expressing themselves by talking about their lives and experiences. For those providing care and support, it enables them to see the person rather than the symptoms of the illness and to tailor meaningful activities and daily life accordingly. Life story is also used to in our approach to wellness and meaningful activity for people living with dementia. Find out more about how support the people who live with us to continue doing all the things they love. Recent research has shown that a calm and homely environment encourages residents to eat, whereas larger, nosier environments can be distracting and even distressing to someone with dementia. This is why in many of our care homes offering specialist dementia care we have created smaller dining areas which feel more intimate and appealing to our residents. Mealtimes are a great opportunity for social interaction and involvement. We ensure that our décor helps to stimulate appetite, whilst our carefully considered menus offer healthy, tasty and nutritious choices every day. Find out more about how we make the most of mealtimes in all of our care homes here. Strong relationships are fundamental to everyone’s happiness and wellbeing. These relationships can be more difficult for a person with dementia to maintain as memory and communication skills diminish. Maintaining close bonds with families and friends is actively encouraged in our care homes, visitors are most welcome any time and can join residents in activities and for meals. Our dementia teams and carers can also offer support to relatives of our residents living with dementia by providing access to information and advice.